The Wabbit waited a long time but finally his radio crackled. "This is Juliet. Confirm Time Zone?" "Zulu," snapped the Wabbit. The Wabbit sounded impatient because he'd been on the same spot staring at empty space for several hours. The spot lay along the course of the new atomic timepiece known as OptoClock and trouble was afoot. But forced to accept a mission for another agency, the Wabbit was unhappy and so grumbled to himself at length. "Report sightings," said Juliet. 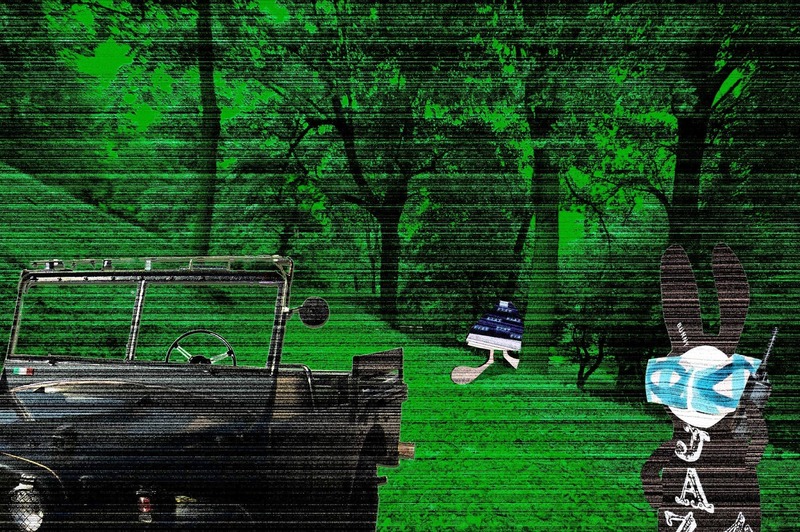 The Wabbit had nothing to report, but from the corner of his eye he noticed a reflection in the jeep's side panel. He stayed still and watched until the radio interrupted. "Commander?" "I have a partial sighting of Tipsy," replied the Wabbit. "Tipsy? How partial?" The Wabbit shrugged. "Well, she has no head." Angry voices at base suggested this was not anticipated. "What about the Zoners, Commander?" The Wabbit was about to say there were no Zoners, when he heard voices in the forest. He watched Tipsy's bottom half stroll off down the forest path and he narrowed his eyes and shook his head. But he ignored it because the voices were getting closer. They were talking about time in a most peculiar manner - and every so often they stopped and laughed. "I'm completely zoned," said one voice. "Did you make any daylight saving?" asked another. "No, there's hardly any interest. I took out a loan." The Wabbit sighed deeply and whispered into his radio. "They're here, but they're on borrowed time."